Offshore Wind Energy Market size will exceed USD 60 Billion by 2024, as reported in the latest study by Global Market Insights, Inc. Shifting focus toward renewable power generation to mitigate the harmful GHG emissions will positively impact the offshore wind energy market. In addition, favorable legislative reforms and fiscal assistance to capitalize on the extensive offshore potential will further augment the industry landscape. For instance, the DOE’s Wind Energy Technologies Office (WETO) funds the research, development and deployment of offshore wind technologies in the U.S. The U.S. offshore wind energy market is projected to exceed USD 5 Billion by 2024. Recent discovery of potential sites coupled with crucial investments to improve the offshore supply chain will drive the industry size. In April 2018, BNOW in collaboration with Société Générale, a French multinational, held a workshop with experts working in the offshore industry to improve the investments in the U.S. offshore sector. Sturdy technological advancements in turbine designs accompanied by improved efficiency and cost reduction will stimulate the offshore wind energy market share. For instance, GE Renewable Energy, in March 2018, launched the Haliade-X, a 12 MW offshore turbine offering a 45% increase in electricity generation compared with current offshore projects. Favorable industrial outlook toward the integration and development of large units along with improving foundation techniques will further complement the business outlook. Increasing funding toward the utilization of clean energy resources from various financial institutions including Asian Development Bank (ADB), the World Bank and International Finance Corporation (IFC) will enhance offshore wind energy market. The UK Government has established the Offshore Wind Investment Organization to facilitate funding toward the sustainable energy resource integration to maintain effective offshore wind supply chain. The turbines account for a major share of the total project prices and play a key role toward the feasibility and plant performance. In addition, ongoing developments in turbine length and size for offshore installations, developing turbine assembly concepts and new blade designs are some of the essential factors strengthening the offshore wind energy market. Introduction of variable transmission devices, superconducting generators and enhanced generator speed are some essential advancements driving the offshore wind energy market. Technological advancements in the construction of effective cooling systems and the use of high voltage array cables will further stimulate the business potential. The UK offshore wind energy market, in 2017 was valued over USD 8 Billion. Favorable regulatory measures, energy security initiatives and decarbonization reforms are some of the key factors that will augment the industry outlook. Increasing fund allocation by leading companies to expand the offshore wind potential will further favor the industry outlook. According to Wind Europe, an investment of about USD 59 billion was allocated in Europe, with major fund contribution from public market transactions, mergers at project levels and new assets. 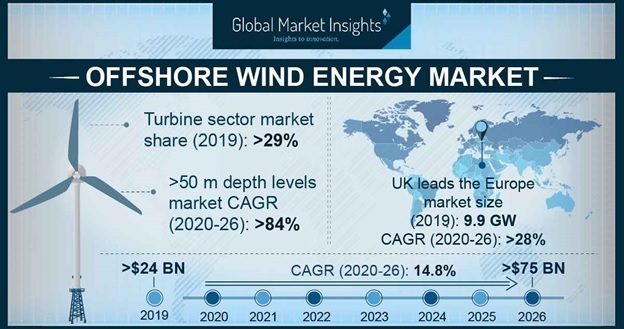 Eminent offshore wind energy market participants comprise Vestas, Enercon, GE, Nordex Acciona, Senvion, Siemens Gamesa, MHI-Vestas, United Power, WEG SA, Goldwind, Envision Energy, Mingyang, Suzlon, Wobben, Clipper, Bergey, Impsa, LM, Enessere, RTS, Northern Power Systems, Availon, Global Energy Services, Prysmian, Furukawa Electric, General Cable, LS Cable, Southwire, Nexans, and Sumitomo.